We respectfully request the release of LAKSHMI the Temple Elephant to a Sanctuary where she can live out the rest of her life with freedom and comfort. Lakshmi has stood stoically for over twenty years outside the SRI MANUKULA VINAYAGAR TEMPLE, Pondicherry, India. She arrived in Pondicherry in 1997; she was then just 6 years old – only a baby. (An elephant's life can reach 80 years, even 120 in exceptional cases.) Born in Assam, it is in Kerala that she was found and selected. Every day, Lakshmi is woken at her owner&apos;s home at 4:00 am. Her Mahout (caretaker) brushes her and bathes her in a tank with contaminated, stagnant water. Then she&apos;s given just a scoop of leftover rice. She&apos;s then led to the temple in shackles—her only exercise. She performs her rituals at 7:30 am, then again at 9:30am and does her circuit rounds with pilgrims following her. She&apos;s then taken home and shackled between 12:00 and 4:00 pm. She&apos;s taken back to the temple for her evening rituals at 6:30pm and 7:30pm. At the Temple she must stand on a concrete floor. By her side is her Mahout with his ever present "ankush" (a metal bull hook) to ensure her compliancy. Lakshmi is suffering, physically and mentally. Her feet are in a deplorable condition and she needs veterinary care. She will receive little or NO veterinary care. She is not a God, yet she is a slave to religion. She has been denied her right to live a natural life......she is Lakshmi, a captive elephant! At the end of her day she is shackled again at her owner&apos;s home. Chained and alone, she has a few hours respite before she is forced to do it all over again....day after day....year after year! This is no life for such a beautiful creature, she should be able to move freely but she is shackled with chains. Elephants are highly emotional, they mourn their dead and they are extremely compassionate to each other. Elephant daughters can stay with their mothers for up to fifty years. Instead, Lakshmi is exploited (as are hundreds of elephants also suffering in India under the guise of religion) she earns the Temple a lot of money, from both the tourists and the locals. Place a coin into the snout of her trunk and after she hands it to her master, she gives you a tap on your head. The film "Gods in Shackles" shows the true horrific abuse these elephants are forced to suffer. It was reported on June 9, 2015 that the Animal Welfare Board of India (AWBI) sent a report to the Conservator of Forests and Chief Wildlife Warden, Puducherry, recommending that Lakshmi be rehabilitated to a forested sanctuary owing to concerns about her health, and also pointing to "illegal ownership." The report states that she displays behaviour typical of mental stress and that she suffers from footrot on all feet. Lakshmi has had no opportunity to go to a retreat and interact with other elephants. There is talk of artificial insemination one day as she is of an age where she can reproduce. Sometimes she trumpets, mostly when she is scared. She doesn&apos;t like loud or sudden noises and during Diwali (ancient Hindu Festival) she was unable to sleep for two nights because of the fireworks. She is also scared of horns (this would add to her mental anguish). "These intelligent, sensitive animals are captured, trained, and exploited for profit illegally with impunity. Just in March 2016 the Kerala state government discovered more than 289 elephants without ownership certificates, but it granted the owners amnesty. This has been rejected by the Supreme Court of India." Please help to fight for Lakshmi, help her to gain her freedom. She mustn&apos;t be forced to endure a lifetime of such tortuous unnatural limitations. Please read petition letter below. Wildlife SOS India D-210, Defence Colony, New Delhi-110024 info@wildlifesos.org. REF: LAKSHMI THE TEMPLE ELEPHANT TO BE RELEASED TO A FORESTED SANCTUARY IMMEDIATELY. We the undersigned respectfully request that the President Thiru. Ramachandran V, Arulmigu Manakula Vinayagar Temple Puducherry India take all necessary steps to release Lakshmi from The Temple and allow her to live the remainder of her life at a sanctuary. We also respectfully request assistance from the Prime Minister, Indian Government, PETA, Tourist and Welfare Agencies in ensuring that Lakshmi is released immediately. There has already been a report dated June 9, 2015 that the Animal Welfare Board of India (AWBI) had sent a report to the Conservator of Forests and Chief Wildlife Warden, Puducherry, recommending that Lakshmi be rehabilitated to a forested sanctuary owing to concerns about her health, and also pointing to “illegal ownership.” The report states that she displays behaviour typical of mental stress and that she suffers from footrot on all feet. It is now August 2016 and no efforts have been undertaken in this regard. Lakshmi is suffering. She has suffered too long. Tourists to your beautiful country are becoming aware of the plight of these magnificent creatures and it is in turn distressing to them as they realise the full extent of this suffering.Please use your influence to ensure that the recommendation already made by the AWBI for Lakshmi is undertaken. Her health would have continued to deteriorate over the past year. 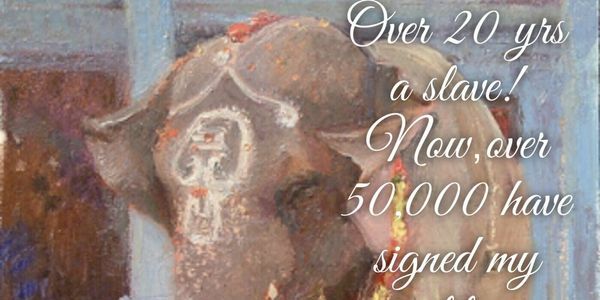 We started a petition ‘DEMAND IMMEDIATE RELEASE OF LAKSHMI THE TEMPLE ELEPHANT TO A FORESTED SANCTUARY’ on July 26, 2016 and have now gathered 12,175 signatures. This petition will remain in circulation and we will continue fighting until Lakshmi is released. 23,467 signatures!! Fantastic everyone - thank you!!! Petition & petition letter together with all signatures has AGAIN been sent to all targets requesting Lakshmi release. PETITION STILL REMAINS OPEN UNTIL SHE IS SAFE. PLEASE KEEP SIGNING & SHARING. PLEASE NOW TAKE THE TIME TO GO https://www.facebook.com/pages/Sri-Manakula-Vinayagar-Temple/244547588897819 AND RATE " 1"
Petition has 15,525 signatures! Your support is fantastic!! Please keep sharing & get friends to sign. Petition has been sent in for 3rd time with updated signatures. We will keep fighting. Petition has 13,300 signatures! Thank you very much for support you are giving Lakshmi. Today,another copy of the petition letter, petition & copies of ALL 13,300 signatures were forwarded to recipients listed. Email contact made with SOS Wildlife India. Contacted by PETA India re email sent on Aug 4, 2016 advising they had received our email & would be in contact. CONTINUE TO SIGN & SHARE -PETITION WILL REMAIN OPEN UNTIL LAKSHMI IS RELEASED. Our petition has now reached 12,174 signatures! Thank you so very much to EVERYONE for all your support. What a fantastic effort!!! The petition 'DEMAND IMMEDIATE RELEASE OF LAKSHMI THE TEMPLE ELEPHANT TO A FORESTED SANCTUARY' has been handed in to relevant recipients inc PETA India. WE ARE 'NOT' CLOSING THIS PETITION!! WE WILL CONTINUE TO COLLECT SIGNATURES AND UPDATE UNTIL LAKSHMI HAS BEEN RELEASED. Credit: Elizabeth Porcheddu for gorgeous Lakshmi image.